BOSTON--(BUSINESS WIRE)--Version 2.0 Communications , a public relations and digital communications firm, today unveiled the next — and final — installment in its Women Mean Business infographic series. First launched in 2016, the series examines the women who are innovating and the vibrant communities supporting them. New to the series today are Austin, TX, London and the U.K., and, as a culmination of the entire series, the United States. Previous infographics in the series include Boston, the Denver and Boulder region, San Francisco, Ann Arbor and New York City. The complete series can be accessed in the embedded multimedia graphic. More on how Version 2.0 Communications is celebrating International Women’s Day is available on our blog . Version 2.0 Communications is a public relations and digital communications agency recognized as the smart choice for disruptors worldwide that must navigate a new era of communications to create or lead markets. Our skilled professionals leverage their years of experience, influencer relationships and innovative, creative and effective communications programs to achieve results that dominate in their markets. Version 2.0 works with a broad spectrum of clients from large consumer brands to professional services organizations and technology innovators. Our global reach allows us to design, manage and implement coordinated communications programs that are designed to deliver the greatest impact. For more information, visit http://www.v2comms.com/ and follow the company on Twitter @v2comms . 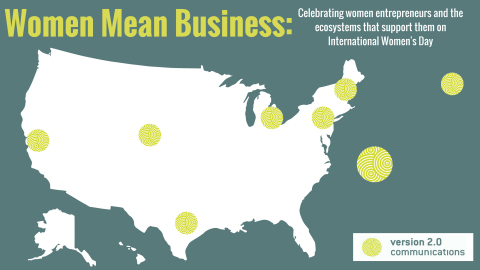 Version 2.0 Communications, a PR and digital communications firm, celebrates International Women’s Day with “Women Mean Business” infographic series.